The Parish Church was the primary site of religious practice throughout the early modern period. This was particularly so for the silent majority of the English population, who conformed outwardly to the successive religious upheavals of the sixteenth and seventeenth centuries. What such public conformity might have meant has attracted less attention - and, ironically, is sometimes less well documented - than the non-conformity or semi-conformity of recusants, church-papists, Puritan conventiclers or separatists. 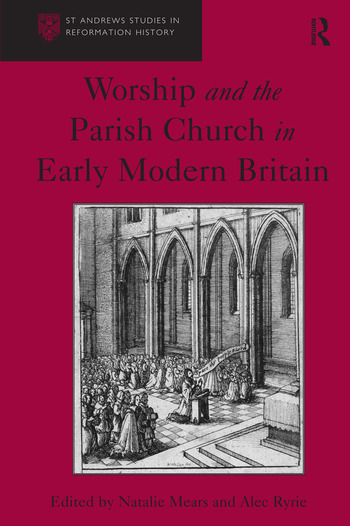 In this volume, ten leading scholars of early modern religion explore the experience of parish worship in England during the Reformation and the century that followed it. As the contributors argue, parish worship in this period was of critical theological, cultural and even political importance. The volume's key themes are the interlocking importance of liturgy, music, the sermon and the parishioners' own bodies; the ways in which religious change was received, initiated, negotiated, embraced or subverted in local contexts; and the dialectic between practice and belief which helped to make both so contentious. The contributors - historians, historical theologians and literary scholars - through their commitment to an interdisciplinary approach to the subject, provide fruitful and revealing insights into this intersection of private and public worship. This collection is a sister volume to Martin and Ryrie (eds), Private and Domestic Devotion in Early Modern Britain. Together these two volumes focus and drive forward scholarship on the lived experience of early modern religion, as it was practised in the sixteenth and seventeenth centuries.